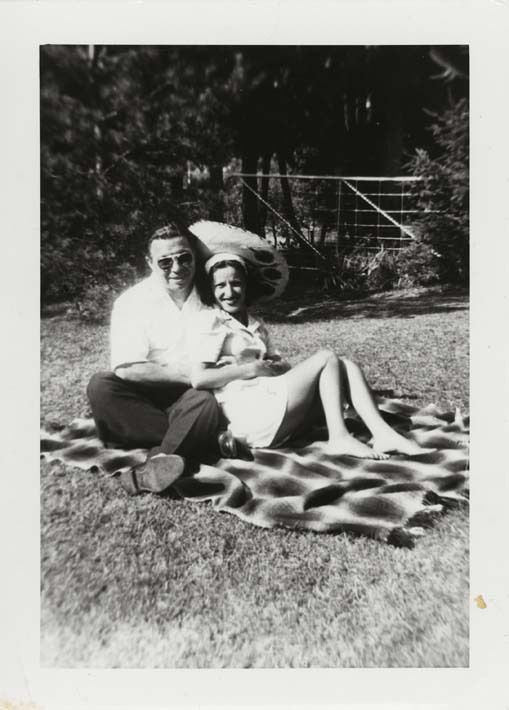 This is a black and white snapshot of Antoinette (Toni) Ciccarelli with her husband, Patrick Ciccarelli, sitting outdoors. They are sitting on a patterned blanket on the grass and he has his arms around her. Patrick is wearing a white short sleeved button shirt with dark coloured pants and shoes. Toni is wearing a wide-brimmed straw hat, a white headband, and a short sleeve button dress. She is not wearing shoes. The couple is smiling at the camera. The background is of a fence and a wooded area. This was likely taken on the same day as DICEA2010.0001.34.